As Spring gets a serious hold around the country, and we see more and more warm days leading into Summer, the sightings of snakes become more common as mating season gets cracking. At the time of writing, in the past week (late September), we have seen and/or been told of about 5 or 6 snake sightings on the MTB trails around us. Yet, we can go some years and never see one. In decades of MTB riding I have never known anyone I've ridden with to be bitten. As Spring turns into Summer, the sightings should decrease. In this article we'd like to explore a tiny bit of relevant info about snakes, and how you might deal with them if you encounter them. Let's start by looking a bit closer at snakes and focus on the things that are beneficial to us to understand as mountain bikers before looking at how to deal with a bite if it occurs and what sort of snakes we are likely to encounter. Are snakes likely to bite? Primarily a snake doesn't want to bite you. Snakes bite for two basic reasons; to eat and stay alive or to defend themselves and stay alive. If you aren't a food source they recognise, snakes are only going to bite in self defense. Therefore, it's wise for us to not appear threatening to a snake we are close to, so it doesn't defend itself. In almost every case, a snake didn't want the encounter with a human and will quickly try to distance itself from you. Don't chase it or block it's path for any reason, even to get a photo. Admire how smoothly it moves and let it go on it's way. Not every snake you see is venomous, however it's obviously best to treat them all as if they are. The common conception is that snakes have very poor vision, and if we think of their eyesight as being similar to ours, it is indeed not great. However, a snake use various senses to get a picture of the world around them, and eyesight still plays a big part of that. Down on the ground, snakes are sensitive to vibrations, they can tell if something is getting closer or further away. They have a tongue and organs within their skin that take in more info from the air around them. Snakes have excellent hearing and sense of smell also. Their eyesight, on the other hand, is very near sighted. A snake's eyes do not see the colour range we do, nor does it see in sharp detail like us. Think of a snake as only being able actually see something well up close, and even then, it's only in a few dull shades. A cool thing for some snakes is they do have a sort of thermal imaging thing happening that highlights the heat of things around them. Very effective for night hunting but fails to distinguish a warm animal from a hot rock or dirt very well during the day. Most importantly though, when something isn't up close, and isn't moving, snakes have a lot of trouble distinguishing an animal or human from it's surroundings. This sensitivity to movement is important to note. How does this help a mountain biker? You stop for a snack, sit on a rock or lean on your bike and suddenly realise a snake is right there. Your heart jumps and immediately want to get away. But what's going through the snake's mind. "That stupid human is wearing pink socks with a red jersey... what the hell?!" Yeah, not likely. The moment a snake realises you are there, it immediately makes a decision. Are you food or danger? Clearly you aren't food, so it goes into defensive mode which is either flee, freeze and hope it isn't seen or stand and fight. Most snakes we see on the trails will choose the safest option and flee. However, if you suddenly find yourself in a position where either you or the snake have gotten too close to each other before realising it, the snake will brace and get ready to defend itself. Locked in on your shape it looks for movement to tell it that you are advancing on it or a threat in any way. Remaining dead still if you are within striking distance is the best defense for you. I've had Brown Snakes relax and simply crawl right between my feet and off on their way on more than one occasion over the years. It's freaky I know, but they really don't want to get into a fight with something that is so much larger than they, neither do they want to waste valuable venom. If you are a few metres away, then very slowly backing away without waving your arms around is usually fine to do. If you do stop in areas that could hold snakes, and need to leave the trail for a pee, work on your bike or sit down for the snack, then make a bit of noise by stomping your feet around at the edge of the trail before moving into the bush. Move slowly to give a snake time to move away. You come flying around a corner and there's a snake on the trail in front of you? What you do next is obviously dictated by several factors. If you have time to stop at a safe distance from the snake and simply remain still until it's crawls away, then that's the safest option of course. If you clearly can not stop in time then how much room you have to play with is another factor. On a narrow single-track you might need to hop the snake which I've done successfully in past. If not, and you've been able to assess which way it's headed, you might be able to ride around the tail end with the foot closest to the snake raised/pedal up just in case. In either case, hopping or bypassing, keep your speed up and treat it like anything else you don't want to run over. We aren't going to go into detail here about each and every snake around and what size they are, how to identify properly, what they watch on saturday night tv or who they date. "Staying in the area after an attack can be dangerous and recent advances in medication mean we can now treat any snakebite with a generic polyvalent anti-venom, so identification is no longer necessary." Treatment advice offered should be taken as a guide only. Every rider should seek their own resources when it comes to their health. We highly recommend doing a 1st Aid Course to give yourself a greater training in treating all manner of injury. Pythons, both Carpet and Diamond are often seen on the trails. Non venomous, these are usually slow moving creatures that will simply crawl away for the nearest cover if they are encountered by humans. If you get a bite from a Python your biggest risk is infection and inflammation. Irrigate the wound well with water, salt water (saline) or water and an anti-bacterial soap if you have it. Avoid bandaging the wound unless there's clear reason to do so, as any remaining bacteria will thrive in the dark, moist conditions provided by the bandage. See a doctor just to be sure as you will likely be prescribed some anti-biotics for infection as a precaution. These guys are one of the most common, and thankfully, most docile snakes you'll ever encounter. They are non-venomous and don't even have fangs to bite you with. They do have tiny grabbing teeth but these are well back in the mouth. I've literally unwrapped one of these poor guys from being wound around my rear wheel and it made no attempt to strike. Once free it simply headed for the nearest tree. They have a larger eye in relation to their head than most snakes and range from green and yellow to olive and creams. In the highly unlikely chance you get a bite from a Green Tree Snake, you have very little to fear. Irrigate the wound well with fresh water, salt water or water and an anti-bacterial soap if you have it. Avoid bandaging the wound unless there's clear reason to do so, as any remaining bacteria will thrive in the dark, moist conditions provided by the bandage. See a doctor as a precaution if you see any swelling or redness forming. In Australia we all know that we have many highly venomous snakes and many are regularly encountered by humans. Thankfully bites are not common for reasons stated above but they do occur and can be life threatening. Right, statements of the obvious out of the way. Whether high on the venomous list or only considered mild, and even though many bites from venomous snakes do not inject venom, every bite from a snake that could be venomous should be treated as serious. Depending where you are around the coastal regions of our country you may see one of several highly venomous snakes such as the Brown, Tiger, Taipan, Death Adder, Copperhead, Red-Bellied Black and many others to mildly venomous snakes such as Whip, Marsh and the Brown Tree Snake. 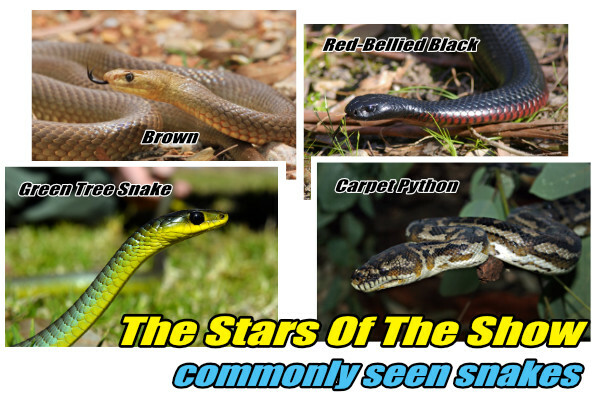 Many of these snake's appearance may differ depending on location. Brown snakes can be quite olive coloured in forests compared to the more standard brown colour found in open regions as an example. For the purposes of venomous snake bite, you can find a basic PDF sheet on treatment HERE thanks to St Johns Ambulance. Do NOT try to catch the snake for identification. ID can be made from the bite puncture at the hospital later. Danger - Assure there's no further danger to the patient or others including yourself. Response - Check the patient is responsive (awake, coherent etc). If no response move to step 3. If responsive, try to keep patient relaxed and still and move to bite treatment. Send for help - Call 000 or have someone else call. If no reception send someone for help. Airway - ensure patient's airway is clear. Breathing - Check patient is breathing. If not, move to step 6 (CPR). CPR - CPR keeps the blood moving to the brain and other vital organs. 30 chest compressions, 2 breaths. Continue until help arrives or patient recovers. Only stop briefly if Defibrillator is being used. Defibrillator - Apply Defibrillator if patient continues to not breath. Still - Keep the patient still and as relaxed as possible. Lie them down and raise bitten limb. Wound - Do not touch or interfere with the bite wound/punctures. This includes not washing, cutting, sucking or applying tourniquets to the wound. 1st Bandage - Apply over the bite wound firmly but don't stop blood circulation. 2nd Bandage - Apply pressure immobilisation bandage. 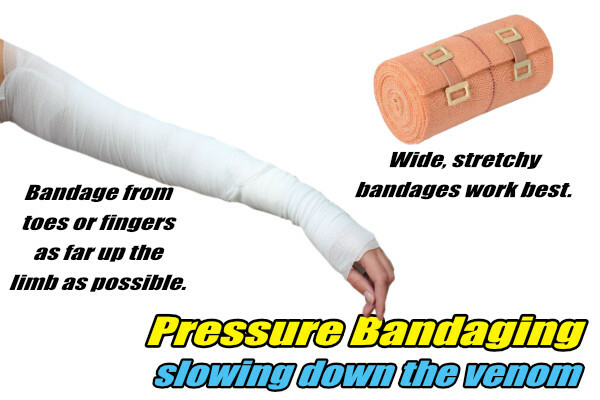 Start right down at fingers or toes and firmly wrap the entire limb if you can with bandage(s). Wide, stretchy bandages are most effective. This drastically slows the blood flow and therefore venom travel. Splint - Splint the limb with anything available to stop further movement, voluntary or involuntary. Check - Check circulation at toes or fingers. Loosen bandage slightly if too tight. Continue to keep patient calm. Snakes will try to leave if given the chance. Ok then, hopefully that helps to put some things into perspective and how to deal with a snake should an unwanted encounter occur. Tuck a couple of big bandages into your backpack just in case.